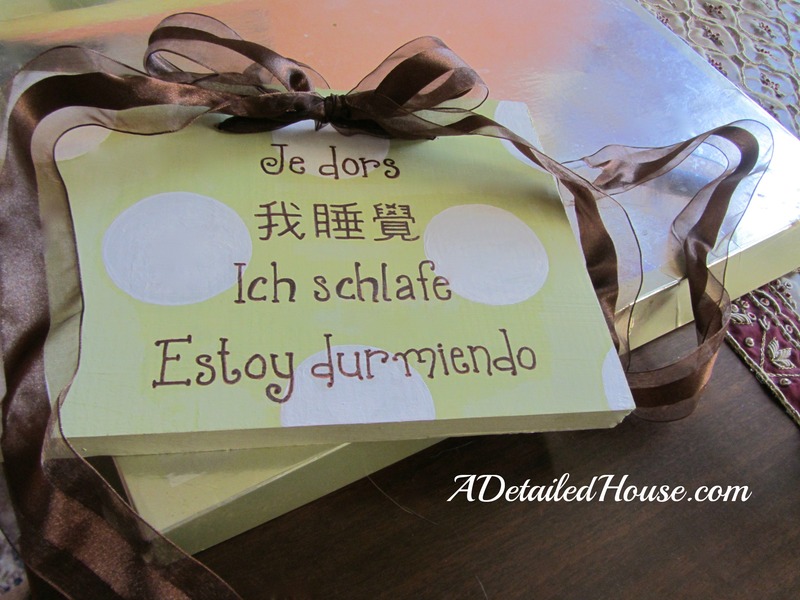 And not wanting to miss a learning opportunity for his little one, I decided to utilize the back as well to say, “I am sleeping” in French, Traditional Chinese, German and Spanish. Why not start early! Using a Word document in the “landscape” paper layout, type out the words you want. Paint board two coats of background color. 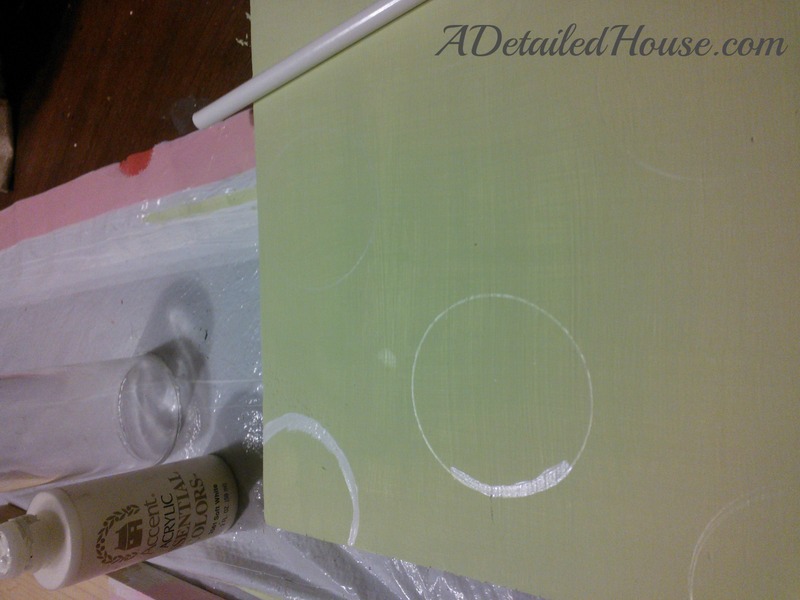 Once dry, find a cup or can (I used a small juice glass) that is the desired size of the polka dots you want. Using the white pencil, trace the bottom of the cup where ever you want the polka dots. 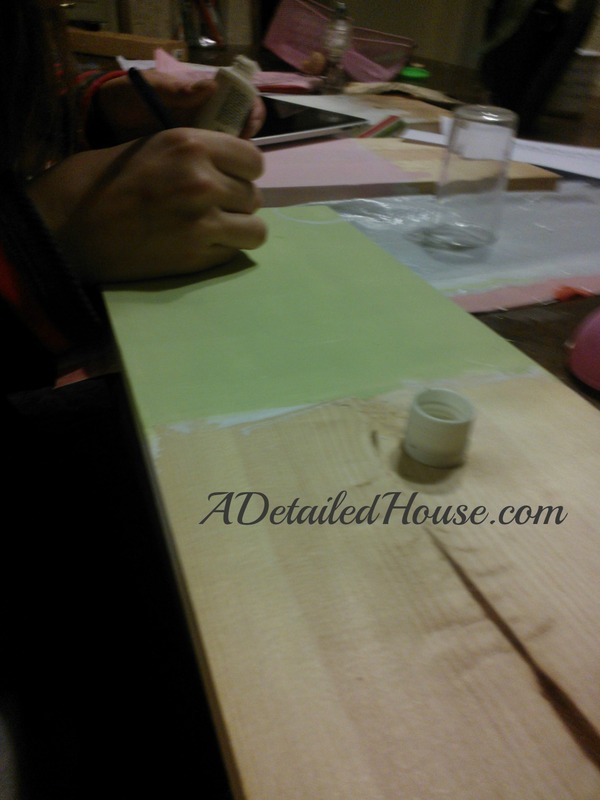 With white paint, fill in the white pencil lines. I did two coats to thoroughly fill in the dots. Lightly tape your printed paper to the board, aligned where you want it. Using a red ballpoint pen, trace the print, pressing firmly! Remove the paper. Drill two small holes at the top for the ribbon. Thread the ribbon through the holes. 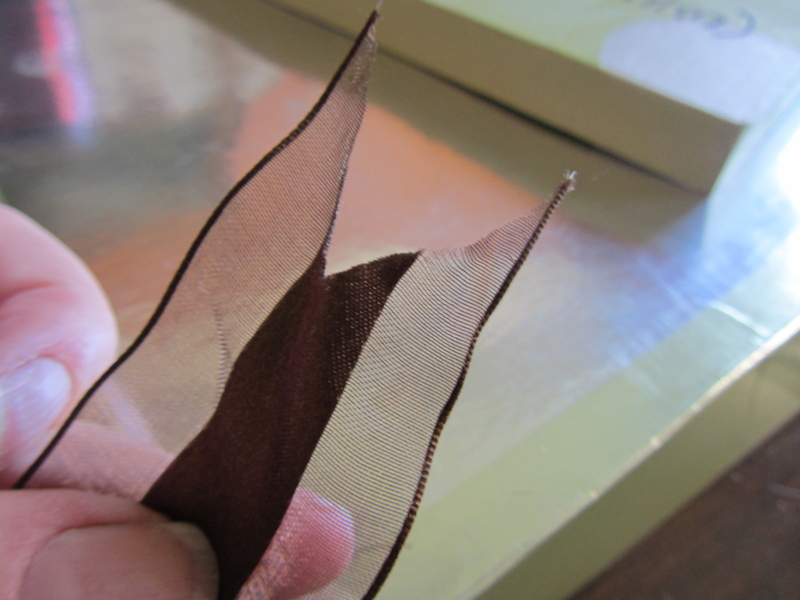 Optional, but pretty, fold the ribbon ends in half and cut from fold on up to a point to make “v”s. 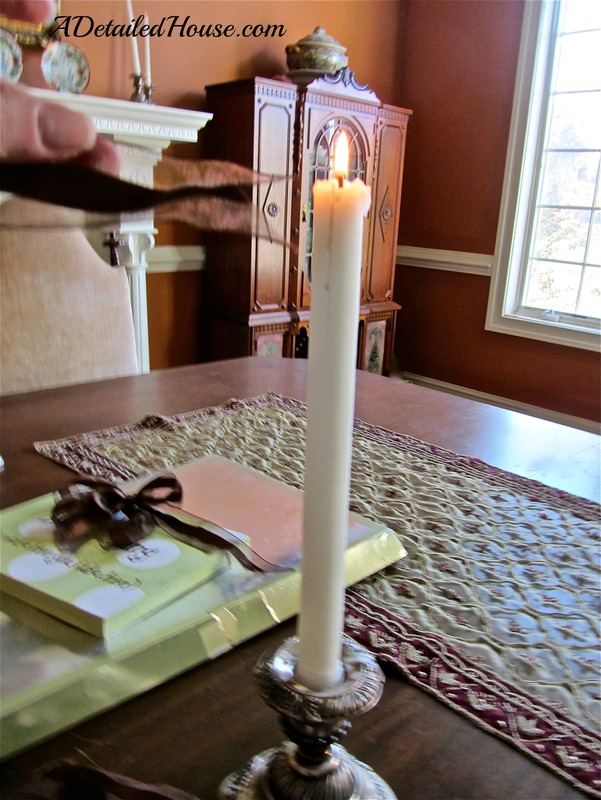 To ensure that the ribbon does not fray over time, pass the ends over an open flame to seal them. Figure how much ribbon (how low you want sign to hang) you will need coming out of the back to hang the sign and pull that amount through the back. 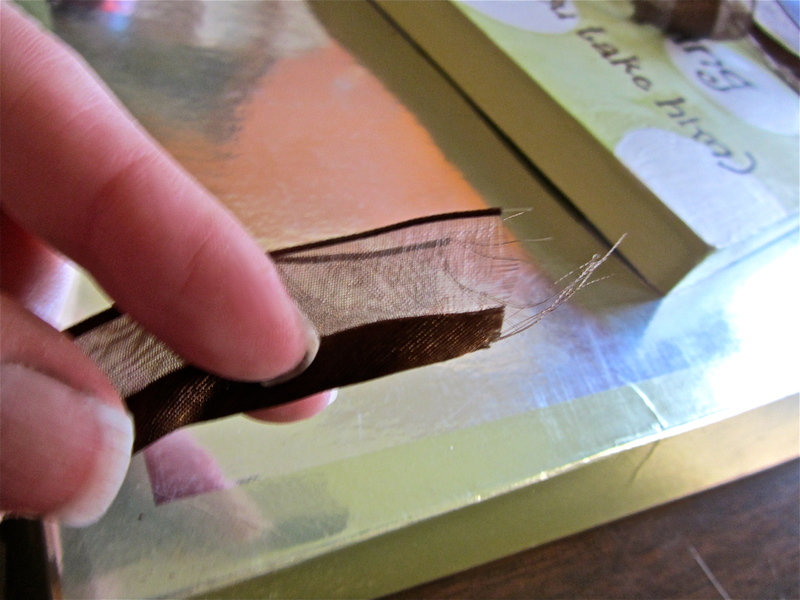 (You may need to make knots over each drill hole with the ends so that they don’t pull out)Tie a pretty bow. OR, you can do what I did: I just tied a bow, then used a second piece of ribbon to make a bow on the other side (around the threaded ribbon) using the ends of that for the door hanger, so that I could have a bow on the door knob. Cost of this project: $0, Yes $0!!!! I had everything on hand! I hope you like this – and this will not be the last of the project: my girls now want name plaques for their doors, but I told them THAT will have to wait until after the holidays! I’m going to mix it up a bit to keep it interesting (for me and you), so if there is anything you all would like to see let me know 🙂 Off the top of my head, I was thinking of jigsawing out a pretty shape (as opposed to just a plain rectangle) and maybe stripes? This is so cute…just had to re-post. That is beautiful (and hilarious). Nicely done. Lucky brother, too. Perhaps you can make signs for your girls for Christmas. Thank you! I’m hoping to make them a puppet theater (time and Nosy Nellys) permitting! We’ll see if THAT happens! Wow! You are ambitious. Best of luck. Can’t wait to see what you come up with. That is a good idea and love how it turned out. Love the double bow. This is SUCH a great idea!! 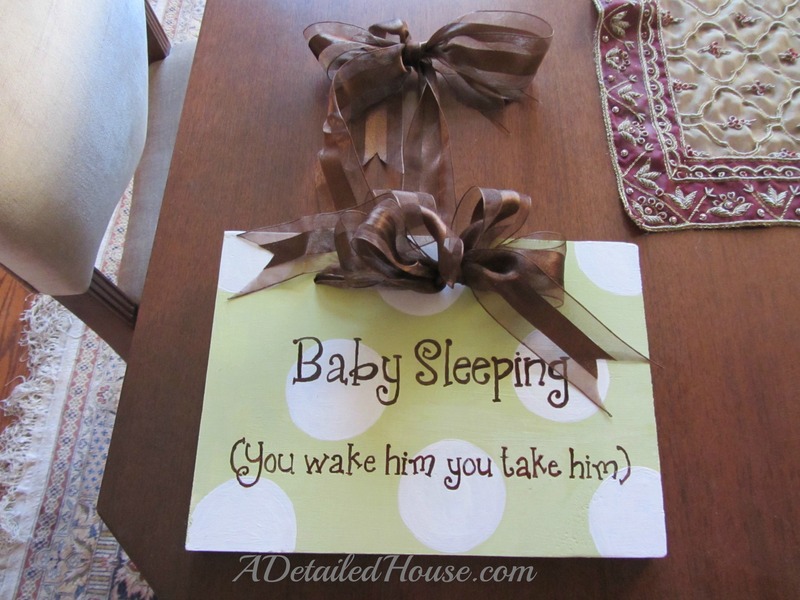 I’m going to make one of these this weekend for a gift, and probably keep it in mind for babyshowers in the future. Thanks for sharing! I love this sign. We have been having a lot of problems with delivery drivers ringing our doorbell even though we have a small sign asking them not to. Once they ring the bell it sets off a chain of frustrating events; dogs barking, baby waking and crying and then very upset mommy! Now I just need to find the extra time to make one of these! You are the “reader” I’m talking about here!!! If you don’t get sleep and your sign doesn’t work, I’ll make you one!! I just reblogged this. I love this sign! I love how this came out & it’s funny because we were just in a winery store that had a plaque “Princess is sleeping” which of course my daughter loved. It was in the shaped like an old door handle plate (don’t know if that’s what you’d call it – you know the old plates around the doorknob that a key would go in. Reblogged this on Design it | Make it | Wear it. This is adorable! 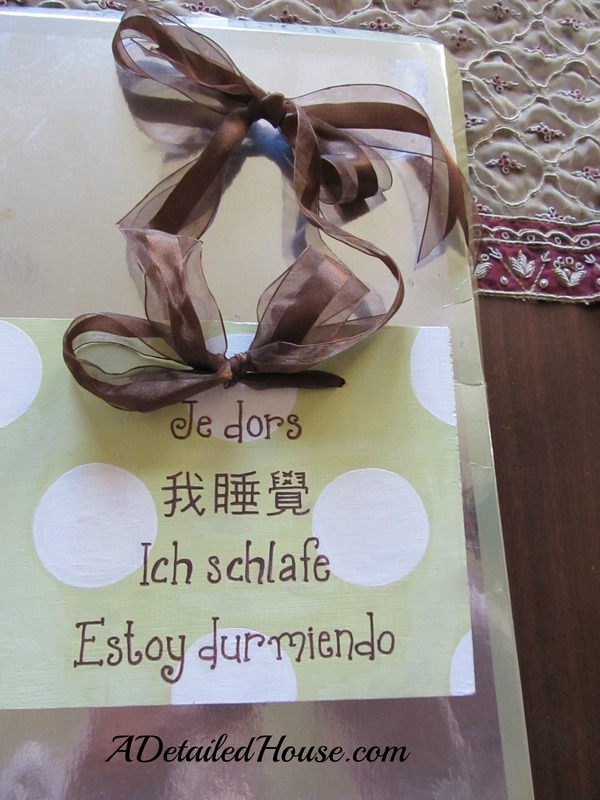 I love that you included some different languages on the plaque, too — what a great idea! Thanks for sharing this tutorial. 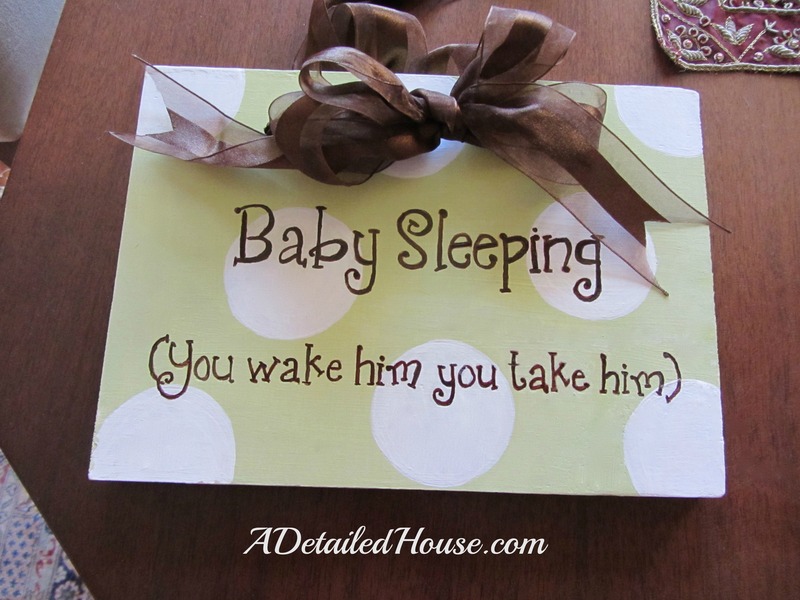 I have a bunch of friends who just had babies, so this would be a great idea for them!